Ola Amigos! Join us in a merry fiesta and toss your sombreros as we celebrate the baptism of these beautiful little twins, Felicity Rae & Riley Eve! Cake and styling experts, Ava’s Cakes and Events, worked their magic to make this event a huge success. The reception décor was a combination of Mezzo-American and the influence of catholic Spain. Muy grande y feliz! This was a Cinco de’ Mayo-like experience you surely wouldn’t want to miss! 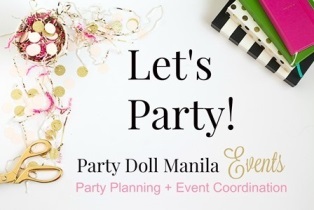 Check out this awesome party with Pop Manuel’s coverage! The twins wore traditional baptismal gowns made of silk organza during their christening. Typical of Mexican fiestas, warm, cheerful colors welcomed the twin’s guests. There were a variety of eye-catching, hand-made flowers and piñatas. Adding to the festive mood was an explosion of colors that seemed to burst forth from the buntings and lanterns hanging on the beams over the hall. With the combination of banners and psychedelic swirls, no one could stop looking up! Staying true to the Mexican Fiesta theme, the stage was adorned with grass sombreros, piñatas and brightly colored hand-made blooms. It was indeed a work of art! Nimble fingers, a creative genius and a whole lot of patience went into each of these flowers that decked the stage wall. The stage floor was covered with a ceramic tiles-looking mat with Mexican-Spanish colonial designs. Flowers arranged in pottery vases, make-believe cactus in old tin pails and a colorful piñata completed the look. Altogether, this party felt like a little trip to Mexico! The centerpiece on every table was composed of potted succulents, a bronze lantern, Gerber daisies and statice in a clear glass vase and in a tin can. The whole arrangement was classy with its simplicity. This is truly a stylish celebration with every bit of a Mexican twist! Juicy grapes, cheese slices and wine- a chill meal for the perfect rustic Mexican atmosphere. Hurry compadres! Get these muy delicioso nachos and tasty churros before it’s too late!